Foxborough, Mass. 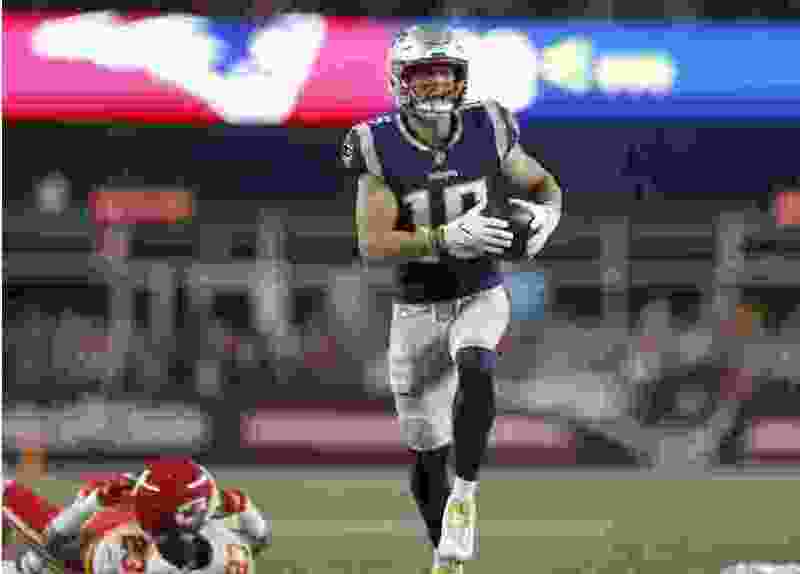 • Stephen Gostkowski hit a 28-yard field goal as time expired, and the New England Patriots beat the Kansas City Chiefs 43-40 on Sunday night after blowing a big halftime lead. The Patriots (4-2) also got another solid performance from rookie Sony Michel, who rushed 24 times for 106 yards and two touchdowns. New England led 24-9 at intermission, but Patrick Mahomes directed an impressive rally for Kansas City. He finished 23 of 36 for 352 yards in his first loss as a starting quarterback, with three of his four TD passes going to Tyreek Hill. Mahomes threw two interceptions in the first half, but was unflappable down the stretch. He found Hill for a 1-yard TD pass that made it 33-30 Kansas City with 8:38 left. With the Chiefs trailing 40-33, he connected with Hill again for a 75-yard score that tied the game with just over three minutes remaining. Steelers 28, Bengals 21 • In Cincinnati, James Conner ran for 111 yards and a pair of touchdowns on the eve of Le’Veon Bell’s possible return, and Antonio Brown turned a short pass into a 31-yard touchdown with 10 seconds left as the Pittsburgh Steelers pulled off another improbable comeback in Cincinnati, beating the Bengals. Ravens 21, Titans 0 • In Nashville, Tenn., the Ravens piled up a franchise-record 11 sacks in the rain. Za’Darious Smith had three sacks and Patrick Onwuasor had two for the Ravens (4-2), who had six sacks by halftime. The Ravens finished a sack off the NFL record for a game, shared by five teams. They outgained Tennessee 361-106 and punted only once. Cowboys 40, Jaguars 7 • In Arlington, Texas, Dak Prescott threw two touchdown passes to Cole Beasley to spark the previously punchless Dallas passing game and rushed for a career-high 82 yards. Dolphins 31, Bears 28, OT • In Miami, Gardens, Fla., Jason Sanders kicked a 47-yard field goal on the final play of overtime after Cody Parkey missed a 53-yard try for the Chicago Bears, who blew an 11-point lead in the final 16 minutes of regulation. Miami’s Brock Osweiler threw for 380 yards and three touchdowns subbing for Ryan Tannehill, who sat out because of an injured throwing shoulder. Falcons 34, Buccaneers 29 • In Atlanta, Matt Ryan threw for 354 yards and three touchdowns as the Falcons snapped a three-game losing streak, holding off Tampa Bay in Jameis Winston’s return as Buccaneers starting quarterback. The Falcons (2-4) scored on their first three possessions and held off a wild comeback by Tampa Bay (2-3), avoiding their first 1-5 start since 2007. Jets 42, Colts 34 • In East Rutherford, N.J., Jason Myers kicked a franchise-record seven field goals, Sam Darnold threw two touchdown passes and the Jets held on to win consecutive games for the first time in more than a year. Morris Claiborne returned the first of three interceptions thrown by Andrew Luck for a touchdown as the Jets (3-3) moved to .500 by taking advantage of mistakes by the short-handed Colts (1-5), who lost their fourth straight. Texans 19, Bills 14 • In Houston, Johnathan Joseph’s 28-yard interception return for a touchdown with 1:23 remaining lifted the Texans. Vikings 27, Cardinals 17 • In Minneapolis, Latavius Murray helped Minnesota revive its running attack with 155 yards and a touchdown on 24 carries, wearing down the Cardinals. Even Kirk Cousins joined the fun for the Vikings (3-2-1) with an option-style run across the goal line in the third quarter, before throwing to Adam Thielen for a score on the following possession. Seahawks 27, Raiders 3 • In London, Russell Wilson threw for three touchdowns, including one off a botched snap in the second quarter. Oakland quarterback Derek Carr left with an apparent left arm injury with 8:52 remaining in the fourth quarter after the last of his six sacks. Washington 23, Panthers 17 • In Landover, Md., Josh Norman bounced back from his prime-time benching by intercepting former teammate Cam Newton and forcing a fumble. Norman ended his 19-game interception drought by catching a jump ball thrown by Newton on a third-and-long play early in the second quarter, his first pick since Dec. 24, 2016. Chargers 38, Browns 14 • In Cleveland, Philip Rivers threw two touchdown passes to Tyrell Williams, and Melvin Gordon had three TD runs as the Chargers banged around rookie Baker Mayfield and the Browns.